Celtic Submari one good night, two departing heroes, three active plans, lust and harlotry, and a belated respect for irony. Last night over 200 of the 660 members of the Villarreal Celtic Submari Penya(supporters club) squeezed into their club room to pay a last tribute to their two departing heroes, Javi Venta and Robert Pires who last Saturday played at the Madrigal for the last time. Both players received a very warm and emotional reception from the Celtic Submari faithful. The Submari President Ernesto Boixader helped Submari youngsters hand over two specially designed “Hands round a globe” statuettes to the players, who patiently participated in individual and group photos until everyone was sated. Javi Venta 11 years associated with Villarreal, was the last of the very few good players to come through the pre Roig system where in the absence of any reserve teams young players were farmed out to local club Onda. Now of course the Villarreal B and C teams are the top of the biggest junior teams pyramid in Spain, all located at the marvellous Villarreal Cuidad Sportiva built as a key part of the Roig vision. Earlier in the day the GGW Editor had formally interviewed Javi Venta in the last of a line of player interviews as part of the work on his book “The Yellow Submarine” due to be published in Glasgow in September. Today the players take part in a closed doors session at El Madrigal before going up to Zaragoza where on Saturday they play their last league game of the season. After that they will disperse to the four winds for their summer holidays. Except of course for the 9 Villarreal players selected in the World Cup 30 man squads announced this week. Villarreal’s nine man World Cup contingent is the third biggest in Spain after the 14 of Barcelona and the 11 of Real Madrid. Not bad for a club from a town of 50,000 inhabitants. The three Plans for Villarreal to qualify for a 9th consecutive season of European football are still all active. In the best version, Plan A, Atletico Madrid buoyed by their triumph over Fulham take at least a point off Getafe on Saturday night while Villarreal win at a Zaragoza now safe from the threat of relegation, thereby ensuring Villarreal of 6th place in La Liga. Plan B has been much simplified by that midweek victory of Atletico. UEFA have confirmed to Villarreal that if Sevilla win the Copa Del Rey on Wednesday night, then the 7th placed Spanish club will get a Europa League place with Atletico Madrid qualifying as holders. So it no longer matters to Villarreal whether Sevilla or Mallorca finish 4th. Plan C will progress today when UEFA take a preliminary decision on whether Mallorca will get a licence to play in Europe next season given their large debts particularly an unpaid transfer fee to Athletic Bilbao for star striker Aduriz. The general feeling within the club confirmed to me by both Javi Venta and Manager Garrrido, is that while Villarreal will do their damndest on Saturday to implement their part of Plan A, they can not rely on Atletico again and are placing more trust in Sevilla delivering on Plan B. Plan A will be helped by the decision the other day of the Spanish FA appeals Committee to withdraw the second of the two cards Capdevila got on Saturday for asking if any of the cards flashed at Villarreal players including himself were meant for Busquets (See Post of 9th May). Given there was no doubt he said what he said, the scrubbing of one card is a welcome proof that common sense and a respect for irony do exist in the highest echelons of Spanish football. Or maybe it was just guilt at not squashing the card Llorente got instead of Busquets. Let’s hope Capdevila, now freed to play on Saturday, scores the winner, and dedicates it to the suspended Llorente, or should that be Busquets! all the best,when is the next party,wee all miss the fietas, in the past. Celtic get ready to mug Old Lady, but better beware, she's on her game. Celtic Players triumph in China. Part Two - Mowbray a better judge than Lennon? Villarreal’s Fantastic Four surf the crest – Next stop – the Top? Celtic fans invade Hamburg What a swell party that was, let’s not wait another 100 years to repeat it. Celtic’s Champions League fate is in the hands of young boys, Romanian Tims and rural Turks. Villarreal's Tommy Gemmell clone, Capdevila finds out the hard way that referees have no sense of humour and particularly don't like irony. Holed 4 times on Saturday, the Yellow Submarine suffers further damage on Tuesday night and sinks beneath the European waves, perhaps for the last time. The St Pauli party begins and should still be going on when the Celtic fans arrive for the Centenary match. GreenGreenWorld is a football blog produced by SISIF, (the Sherbrooke Institute for the Study of International Football). The SISIF Director, Sandy Jamieson, has been an active student of world football for over 40 years and has an extensive network of information, knowledge and contacts in Europe, South America and the rest of the football world. Although SISIF is based in Glasgow, Sandy currently spends most time at his home in Spain where he is finishing a book about Villarreal, “The Yellow Submarine”. He is a writer/consultant and his previously published novels “Own Goal” and “The Great Escape?” are available from Ringwood Publishing or Amazon. Mainstream published his previous book on Scottish football. The positive story of how an invasion of a small Spanish town, Vila-real by 10,000 Celtic supporters lead to the development of a New Model of football relationships based on respect and affection, not hatred and bitterness. A model which offers important lessons for modern day Scotland. Click here for fuller details and ordering information. The amazing story of how a wee club from a small town of 50,000 population established themselves as the 4th best team in Spain and the 12th best in Europe. It demonstrates proof that integrity and community can still produce success, irrespective of size, and offers a morally superior alternative to reliance on American and Russian Billionaires or Arab dynasties. Read about the Celtic Supporter who took a fatal revenge on both. Like novels about Scottish Politics, Football and Society? 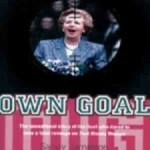 Then OWN GOAL is the book for you. Click here for fuller details and ordering information. Like reading novels about football? Then try "The Great Escape?" Celtic get ready to mug Old Lady, but better beware, she’s on her game. Copyright © 1996-2010 greengreenworld.co.uk. All rights reserved.